Desdemona (Conni Mah) has her eyes on Princeton University in Lauren Yee’s Ching Chong Chinaman. Photo Credit: Lillie Cameron. American society is often referred to as a cultural melting pot, a concept which vastly differs from Canada’s cultural mosaic. For any unfamiliar with the term, the melting pot refers to a society where its members have ‘melted’ into a homogeneous culture, adopting a singular identity (“American”). While some may dislike the idea of the melting pot, there are others who fully embrace assimilation like the Wong family who are as American as apple pie. Maybe too American, in fact, if you ask daughter Desdemona (Conni Mah). American playwright Lauren Yee’s Ching Chong Chinaman tells the story of Ed (Ben Wong) and Grace Wong (Grace Lu) and their two children, Upton (Devin Kotani) and Desdemona. The Wongs are a suburban Chinese-American family with all the usual troubles. Upton spends too much time playing World of Warcraft, Desdemona is stressed out about her grades and being accepted into Princeton, and Ed and Grace have communication problems. Everything drastically changes, however, when Chinese immigrant J (Kida Nakamura), hired by Upton to do his homework and chores, starts living at the Wong residence. J’s presence brings to surface questions about cultural identity that the Wong family has never seriously asked themselves before. 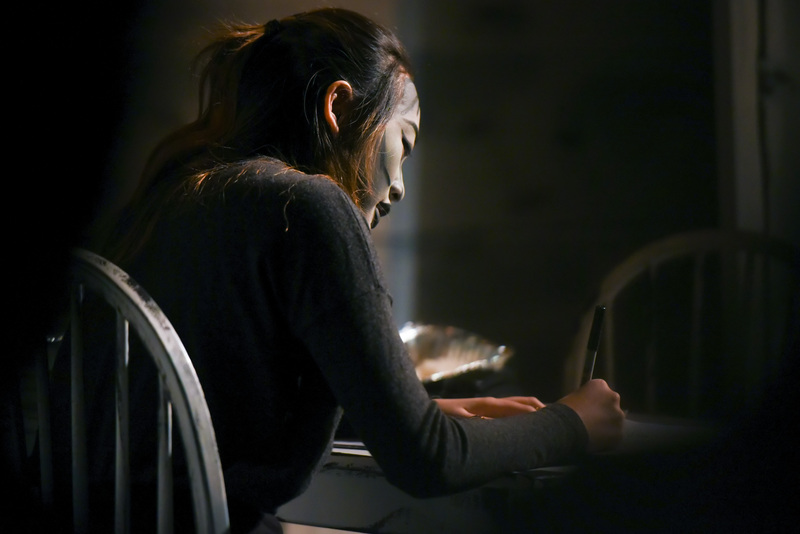 Much of the play is driven by Desdemona’s struggle writing a compelling admissions essay for Princeton. Desdemona cannot think of any obstacles she has had to overcome as a well-to-do American girl living in a nuclear family. In search of inspiration, and after watching the Joy Luck Club, Desdemona decides to explore her Chinese ancestry for help writing her essay. That is a big part of what Yee goes after in this satirical comedy, that ethnicity, even the lack of, only matters when necessary. Never at any point of the play does the Wong family experience any sort of ethnicized discrimination. A lot of that is owed to the fact that the family plays the White Man’s game, which is not just golf in this case. Striking white makeup on the actors’ faces – with the exception of Nakamura – emphasizes the fact. Yee’s point is that sure, people enjoy Chinese things, like fortune cookies, but that is as far as it goes. There is a lot to be gained socially when immigrants totally assimilate into American culture, and plenty to lose out on otherwise. Cultural identity effectively becomes more about politics and less about meaningful self-perception, something Desdemona eventually struggles with in her investigations. Given the eye catching title of the play, audiences should not be surprised that Yee’s satire burns hot. Yee’s oddball humour, too, makes for an enjoyable visit with the Wong family, until the second act anyway. The second act shifts gears in terms of tone, leaving us with something of a messy ending. Still, there are a lot of laughs to be had, particularly from the Wong family’s unease trying to connect with J – who they call Ching Chong, among other stereotypical names. Limited space inside the Motel Theatre stifles the actors’ performances. Added chairs in the front means the front row has to tuck in their legs so not to hit or trip any of the actors. Nakamura and Lu have little room for their tap dance routine, which sees big leg movement from Nakamura. The lack of space creates hesitation, hindering the sort of pace needed to deliver Yee’s comedic material. Director John Iglesias might have done well by not adding any more chairs to an already tight space. Maybe JP Thibodeau’s ‘white washed’ design for the Wong residence could have been scaled back, too. Mah displays great comedic chops as Desdemona. Mah’s hilarious teen angst plays well against Wong’s Ed, a corporate type who rather be on the green than at home dealing with his family. Lu’s Grace is a lonely housewife who everyone ignores, everyone except for J. Lu’s blossoming personality is a lot of fun to watch, especially as the tables turn on everyone else. Kotani plays pro-gamer Upton with delight. The mostly silent Nakamura really steals the show. Nakamura’s expressions of confusion at the totally strange Wong family are hilarious. Otherwise strong performances are troubled by several fumbled lines of dialogue, unfortunately. Overall, Yee’s Ching Chong Chinaman is a very funny play that has a lot to say, and says it brilliantly, about America’s melting pot. While Yee’s strong writing may trip in the second act, the Wong family is still worth visiting, thanks to the ensemble’s dynamic performances. Iglesia Productions’ Ching Chong Chinaman runs Oct 27 – Nov 7 at the Motel Theatre (Arts Commons).